Let me preface this post by saying my husband and I make a really good team. We often finish each other's sentences or pick up the phone to text only to find the other has texted at that same moment regarding the exact same thought. We're that couple. We work really well together, rehabbing and remodeling a house that was more a "Tearer-Downer" than a Fixer Upper. We could be the Chip and Joanna Gaines of Woodinville...yeah, only if we took Starbucks through an i.v. to give us the energy for four kids and a billion business ventures... Ok, so maybe we are Chip and Joanna Lite. When it comes to DIY or home renovations, even interior design, we are pretty much on the same page. I do the design end of things and he's in charge of the implementation. That's one of the many things I love about my hubs. He knows stuff. He can figure out how build a fence, how to pour the concrete pavers I had to have leading up to the front door and how to fix my car when it breaks down. He has come up some ingenious ideas, like when I suggested using some left over granite for the fire pit out back, he figured out the construction using materials left over from the demo of the house. He really does amaze me with his handiness. Although, I think he secretly cringes inside when I utter three words, "I have an idea!" He doesn't run away screaming or plug his ears and pretend he's gone deaf, and sometimes, he takes the concept a step further. He usually figures out a way to implement my vision, making what ever idea I have come to life. Take for instance my living room refresh project. I got him on board to paint the walls a VERY dark gray. A bold leap for most, especially those slightly resistant to change. He was a sport. We went to Home Depot on date night to buy the paint; although truth be told, Home Depot is usually our date night destination. He spackled, he taped, he textured, he painted. Two walls, initially, that was what I thought I wanted. I immediately fell in head over heels with the theatrical drama of the deep charcoal walls. I couldn't wait to put all the furniture back into the room and start styling my funky collections. But as I stood in the door way, admiring his beautiful, meticulous work (did I tell you he's a perfectionist?) something felt incomplete. The two dark walls were having a conversation, the front window wall with its draperies, green door and the view of the greenery out side the picture window could easily join in the discussion, even though it was still painted its original color. But the longest wall wasn't capable of adding anything. It felt sad, lonely, left out. "Wait until you hang the artwork," he said when I subtly suggested I had changed my mind. Actually, I had listened to the room and now needed this poor dejected wall painted. "If you paint the long wall, it will be too dark. When you get the art work up it will look better," he said cleaning up the paint brushes and putting away the paint supplies. 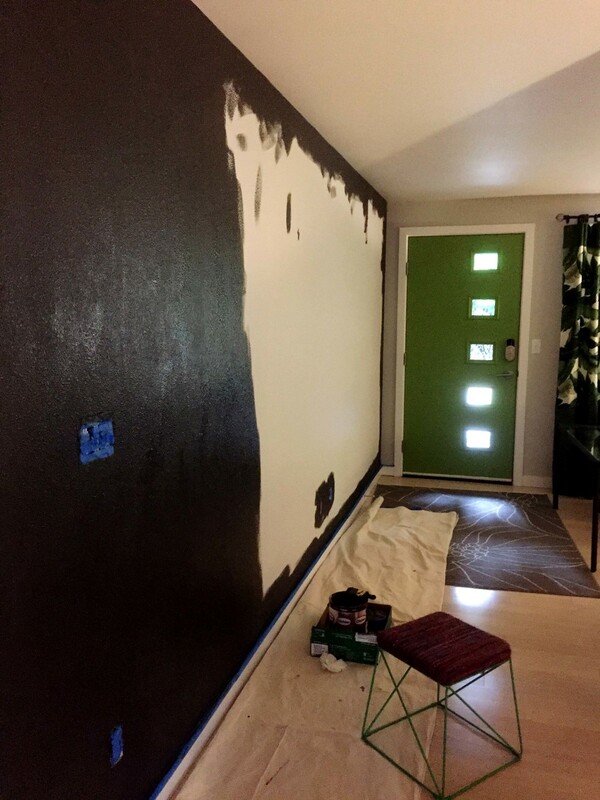 I wasn't entirely sure if he hated the idea of three walls in a rather small room being a really dark gray or he just really didn't want to have to paint another wall. I knew enough not to push it. So I waited. I worked on getting the gallery wall mapped out. I spent some time with my family, and plotted my next move. My husband's airport shuttle had barely left the driveway as I pulled out the painters tape, collected the necessary tools and paint and got to work. With each stroke of the brush, I felt better, the wall felt better, more included in the rest of the space. Ahh, much better. I was feeling just a tad guilty, after all I had barely let the door close and I was going behind his back. "How mad would you be if I painted that wall?" I asked, knowing full well there really wasn't any going back, only starting over. Turns out he was mostly concerned that I do it "right" (I did mention he's a perfectionist) "I'm sure what ever you do will look great!" Even though it is a small room and the ceilings aren't very high, the dark walls actually make the room feel bigger. Dark recedes, pushes the walls out visually and blurs the corners of the space. It is as dramatic and moody as I had envisioned. He's home from his business trip and loves the paint on all the walls. He even complimented me on my painting skills. So if you're not sure if you should paint all the walls in your space you need to listen to the room. Your walls can talk. Sometimes, if you listen to a space, it will tell you what it needs. You don't "speak" wall? I do! Drop me a line and I will help you figure out just what your room needs to make it and you, happy. Stay tuned for the after pictures in my next posts. Better yet, sign up on my email list and get new blog posts right to your in box!